“Merolla’s work is concerned with bereavement: the tension between public and private grief, social customs and material culture of mourning, and objects as repositories of memory, which both retain and transmit meaning. " 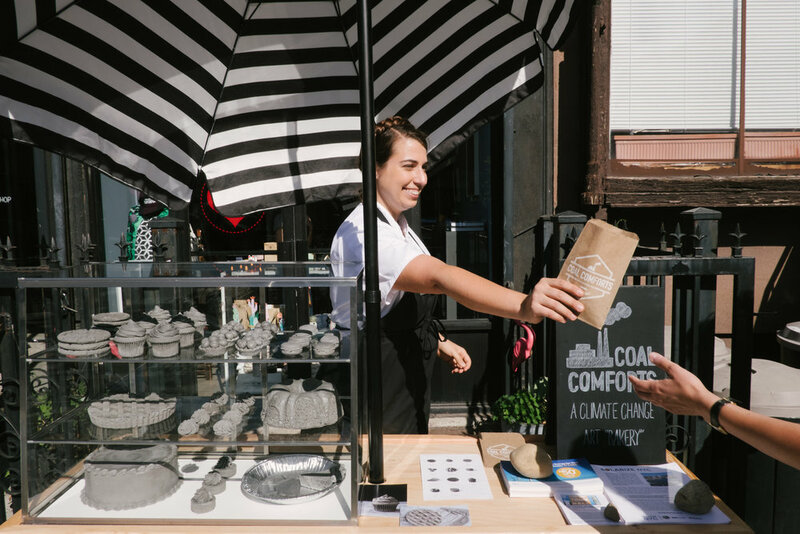 Coal Comforts is a concept bakery in which traditional baked goods are replaced with inedible versions made from coal ash. An evocative material, ash suggests both personal mortality (ashes to ashes, cremation) and communal annihilation by way of mass destruction. On the face of it, these baked goods look just like the real thing, but close inspection reveals that they are not what they seem. The familiar forms of cookies and cakes generally evoke fond memories, but the confounding of expectations about what is on offer at the “bakery” invites the viewer to question the nostalgic impulse itself. Nostalgia persuades us that what is familiar is innocuous, and in so doing masks a harmful reality—that our overindulgence in fossil fuels has been—and will be—our undoing. How was Coal Comforts born? I work with a lot of affectively charged materials, and I’d wanted to work with ash for some years on account of its association with mourning. After the 2016 U.S. election I was really drawn to it, in part because of the role that the coal industry played in the rhetoric of the Trump campaign, and in part because ash is such a potent metaphor for devastation and loss. My first pieces in ash were sandwiches, because the week following the election I found that food lost its savour, and all over the country people were sharing in that collective sense of defeat, as if our hopes for the future had gone up in smoke. I moved on to baked goods because I wanted to create the ultimate nostalgic illusion: something that appears innocuous and evokes a sense of harmless pleasure and timelessness, but in fact is the opposite. 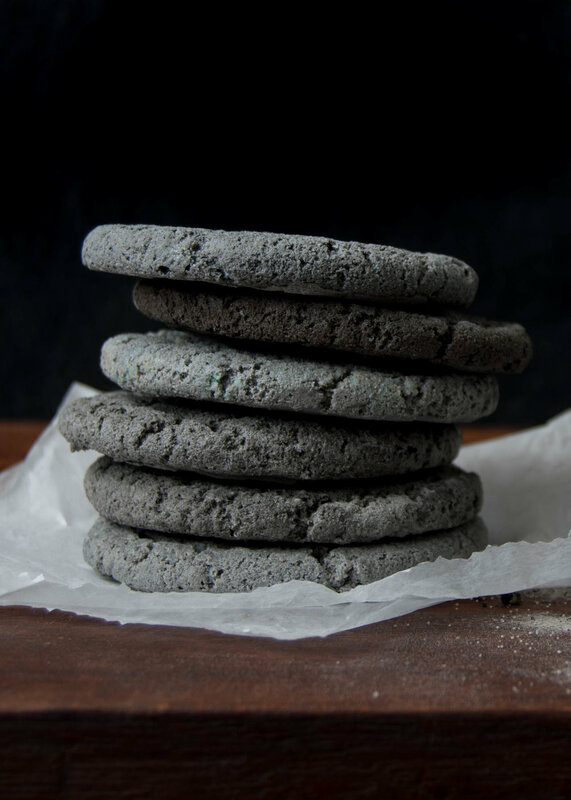 The coal ash "baked goods" are tangible evidence of our overindulgence, and of our insatiable appetite for toxic, ecologically devastating fossil fuels. I don’t really think of myself as an environmental artist, or an environmentalist, even as environmental concerns continue take on an even larger role in my work and life. But I think that is just a natural outgrowth of developing a deeper awareness of what is at stake, which I hope would be the case for everyone! There are so many points of entry for developing an ecological consciousness, and I think that label can be a barrier to people who aren’t on the left side of the political spectrum but who might share some of the same goals and values. The urgency of climate change—and the political situation in the U.S.—inclines me to trade some ideological coherence for pragmatism. Would you say that your art is purpose-driven? If so, what do you aim to accomplish through your creative expression? It's my hope that the work leads people to think differently about something, or revaluate something that they took for granted or never really considered at length. And that can be really subtle—generally there is not one conclusion I hope they draw, it’s more that I hope it occasions reflection that otherwise would not take place. Ideally it is different for everyone, and that it reaches people in a way that is personal to them. Unless you live in close proximity to a power plant or mine, you are shielded from a lot of the devastating externalities of the coal industry. But you’re still part of the problem by being an energy consumer. Most people have no idea where their power comes from and what health and environmental consequences it has—on frontline communities and the world at large. It’s especially ironic when you consider how hyper-focused we are on what we eat, whether it’s healthy, even whether it’s “clean.” So my hope is that this project enables people to see their own invisible consumption habits in a new light, to learn where their power comes from and demand (and, where possible, choose) sustainable alternatives. Climate change and water quality. It seems absurd to me to think of water anything other than a human right, and to take risks with this most precious resource.